We moved to a new house and my in-laws kindly gifted us this beautiful door knocker. One of the many blessings of this new house is that it came with new windows and new doors. I called the company and asked if we installed the door knocker on our door would that impact our warranty? Sure enough, it would, actually it would completely cancel our warranty. I am so glad that I asked! A friend suggested that we attach it to the outside of the house, near the door, but we didn't want to possibly ruin the siding as replacing that is not in the budget right now. During Christmas vacation together we all talked about doing the 23andMe DNA test. On a whim, we all purchased them and did it and were surprised when my results came back to show that I am 32% Irish. My family has NEVER talked about being Irish so this was a big surprise. After many hours of research on Ancestry.com, I discovered where my Irish heritage came from and I love that my in-laws thought of incorporating this into our housewarming gift. 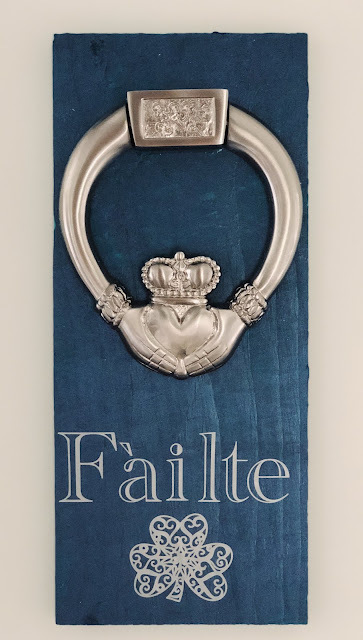 I was determined to find a way to incorporate this door knocker into our home. I purchased a piece of thin wood at Michael's craft store and first painted it a teal color that is used in our living room decor. I wanted it to have a bit more depth so once the teal color was dry, I then painted a darker blue on top by tapping the paint brush up and down on the board rather than coating the paint on the board. This simple technique pulls the color up and shows the teal through the blue ever so slightly. Using my Cricut Maker I cut out the word Fáilte (which means Welcome in Irish) and a clover in vinyl and attached it to the board. I chose to superglue the knocker to the board using Gorilla Glue and then attached the board to the wall using 3M strips. 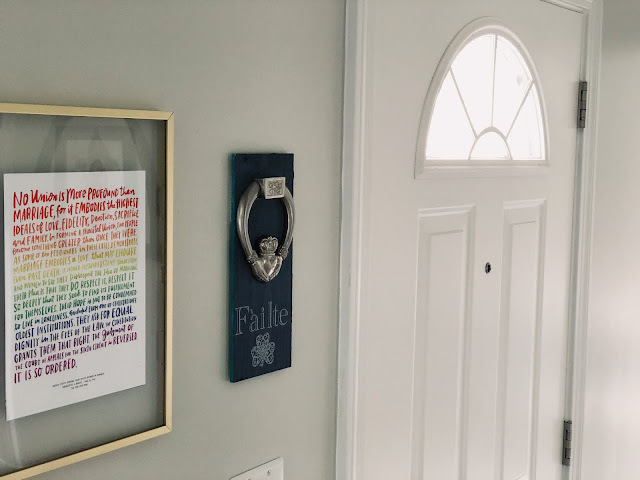 I love how it has turned out and every day we think of my mother and father-in-law as we leave the house.